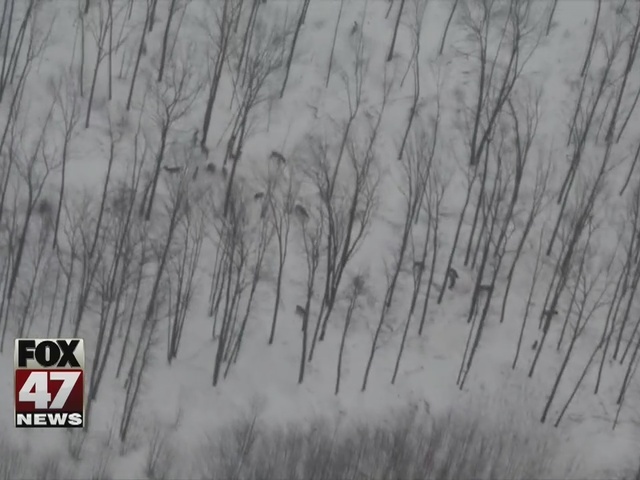 The DNR is giving us a look at the unique way they keep track of the state's elk population. Two airplanes recently flew over the northern part of state to estimate how many elk there are. The DNR says because of their size and the fact they're typically found in groups, they're a great animal to count by air. You can watch video of the aerial survey by following the link within this article. The DNR counted 1,002 individual elk-- estimating the total population at 1,371 elk. That's more than double the last estimate in 2014 of 668. The number of animals seen during an aerial survey is always an underestimate, because not all can be seen from the airplane. Although winter is the best time for an aerial survey because elk stand out against the white snow and leaves are off the trees, they still can be missed among dense conifer trees, which do not drop their needles annually. Therefore, to provide a more accurate estimate of elk, a correction factor is used. The correction factor, developed by running experimental trials on radio-collared elk, is now the standard practice among wildlife managers across the nation. DNR Field Operations Manager Brian Mastenbrook said part of managing an animal’s population is having clear goals, and today’s elk management goals are to balance the population with the available habitat, or food and cover required; use hunting as the primary method of population control; and improve the public’s understanding of elk. He said the elk population goal is 500 to 900 animals in order to reduce crop damage, disease concerns and forest regeneration, while maximizing recreational opportunities. "Michigan has come a long way with elk management," Mastenbrook said. "Elk had disappeared from Michigan in the late 1800s, and today’s population is a result of seven elk released in 1918, just outside of Wolverine. Even though elk are found only in the northern Lower Peninsula, they are an important part of Michigan’s natural resources history and also a great conservation success story."